Desserts - Enlightened Solutions Ltd. - Paleo Nutrition - Designed By Nature. Peel and pit avocado and cut into large chunks. Place in a food processor along with the other ingredients and blend until smooth. You can add more coffee if the mixture is too thick or lumpy. Scrape down the sides of the bowl to make sure the cocoa is evenly distributed. Blend until smooth. Serve in a parfait glass and enjoy! A delicious alternative to ice cream for those who are lactose intolerant or avoiding dairy for any reason. 2 teaspoons extract - it doesn't have to be vanilla! The JR Watkin's Company has an impressive selection of extracts... everything from raspberry to root beer. Blend all of your ingredients in a blender or with an immersion blender. Process in an ice cream maker for 20 to 30 minutes. Freeze for 2 hours prior to serving. This recipe is less sweet than some people are accustomed to. So, while kids and sugar addicted adults may not appreciate the deep chocolate flavours, those with a more discriminating palate will!! This dessert has a firmer consistency than pudding, and is a great follow-up to any meal. -6 ounces ( 170 grams) 70% dark chocolate, chopped into bite sized pieces. Green & Black's Organic makes wonderful bars, but if you can't find it, Lindor, Dove or Desirs make decent dark chocolate bars that are low in sugar. I do not recommend baker's chocolate for this. Rather, buy the bars... the quality will make the difference. 1. Blend chopped dark chocolate, eggs and vanilla in a food processor until smooth. 2. In a small saucepan, heat coconut milk until almost boiling. You will see steam rising from the surface, but it should not be bubbling yet. 3. Slowly pour the scalded coconut milk into the blender and blend until smooth. 4. Place 4 fresh raspberries (or 3 orange slices) in the bottom of four 8 oz. soufflé dishes or ramekins. 5. Pour chocolate creme mixture into the dishes over the fruit. 6. Cover each dish and chill for 2 hours. 7. Garnish with more raspberries or oranges. If you are using oranges, blot them dry before you use them. You may garnish with shaved chocolate if desired. Place a heat proof bowl over it in a double boiler fashion and pour the coconut milk in it. 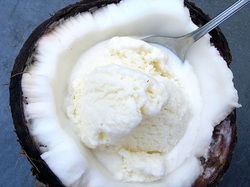 Put vanilla seeds or vanilla extract with the coconut milk and heat until hot, but make sure it doesn’t come to a boil. If using flavorings such as mint or dark chocolate, you can add them now. You can also add chocolate at the end of the process to keep the pieces whole. Whisk the eggs of yolks in a separate bowl. Add one ladleful of the now hot coconut milk to the eggs while whisking quite vigorously. What you’re doing is tempering the eggs and slowly bringing the temperature up without cooking the eggs and risking that they scramble. Add two or three other ladlefuls of the coconut milk mixture and incorporate them to the eggs while whisking continuously. Take the tempered eggs and whisk in the bowl where the rest of the coconut milk is on the double boiler. Whisk for a couple of minutes non-stop to form a thick custard. Make sure it doesn’t get too hot and the simmering water doesn’t touch the bowl. Once the custard is ready, remove from the heat source and let it cool on the counter or the refrigerator. You can add any other flavoring you want to use once the custard is cold enough to put a finger in it and feel comfortable. Take it out of the freezer for about 10 minutes before enjoying so it softens a bit. Serve with added coconut milk, berries, coconut flakes or any other flavoring you might like.